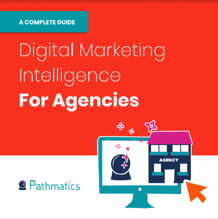 This resource explains what digital marketing intelligence is, why agencies should care about it, and how this technology creates massive value for agencies. Ways agencies retain and grow existing client accounts, while winning new business using data insights. How digital marketing intelligence drives business development, client onboarding, strategy, planning, and more. Save time with reporting and optimization by incorporating new technology into your day-to-day. Fill out the form to get your copy of Digital Marketing Intelligence for Agencies: The Complete Guide. Pathmatics digital marketing intelligence platform brings together display, social, video, mobile, and native data, enabling marketers to take action. Clients gain visibility into the path that each impression took from publisher to viewer, with access to estimated ad spend and impressions, a vast creative library, publishers for specific brands, and unique data on where and how digital ads are delivered. Pathmatics helps agencies and brands adjust marketing plans and optimize campaigns in the digital ecosystem.